Lawn Fawn CHA 2014 Catalogue Challenge! I have been working hard over the last week on my entries for the challenge, and am finally able to reveal them, just in the nick of time! I have two posts today to cover my four entries. First up, Snow Bunny and the Gumdrop Candy Mountain! 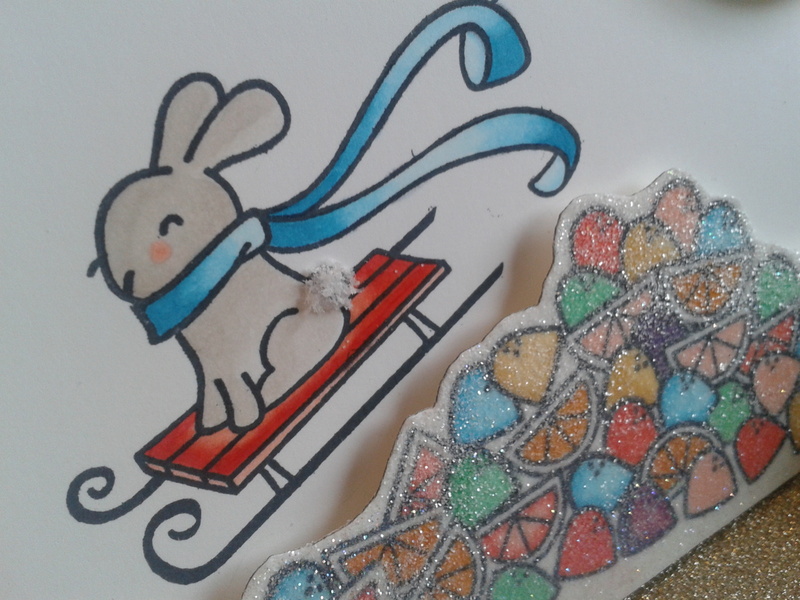 Everyone knows this little cutie, Winter Bunny!! He’s back for a whole new sledding experience! I colored him (many times over to get all the shading just right) with Copics and added a cottontail with white Flower Soft! Delicious and so sweet, isn’t it? 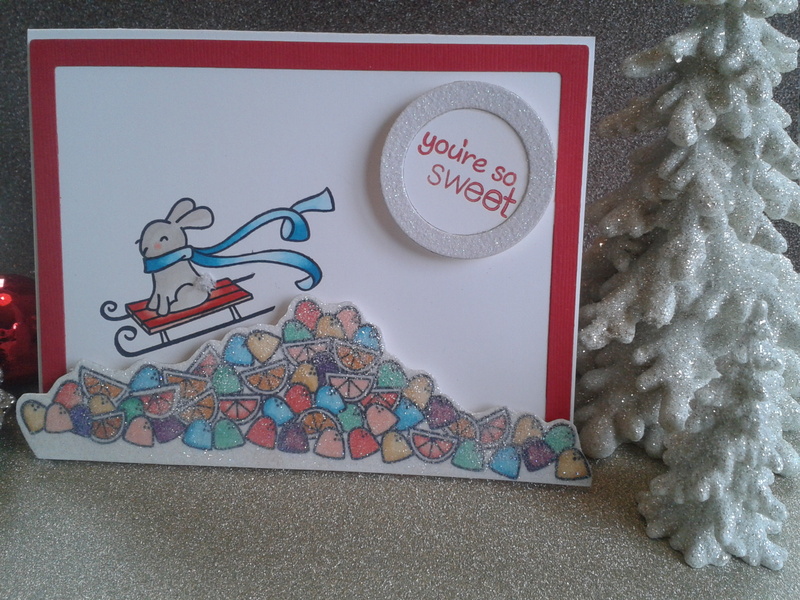 I stamped every gumdrop and orange slice from Sweet Christmas, masking as I went. Then I colored each piece with Copics. 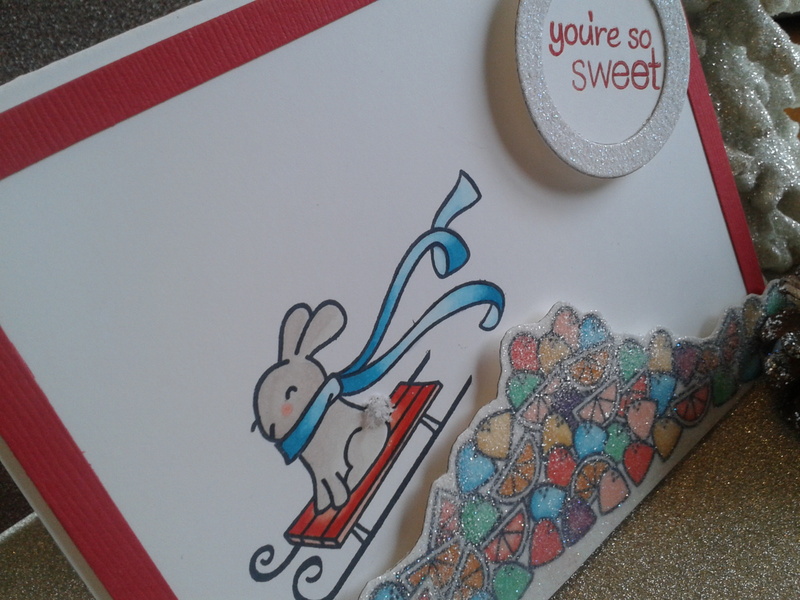 I then covered the whole bunch with Versamark Dazzle, sticky embossing powder, and Stampendous glitter! This technique I used for my Holiday Bags, which you can see here. 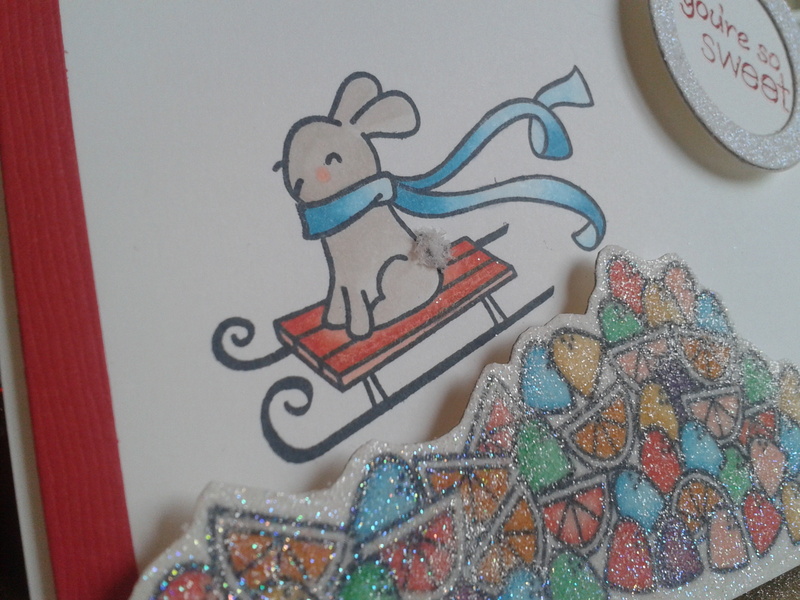 For the sentiment, I combined two of the stamp sets, Critters in the Snow and Sweet Christmas. Next up, Peppermint Candy Mountain! 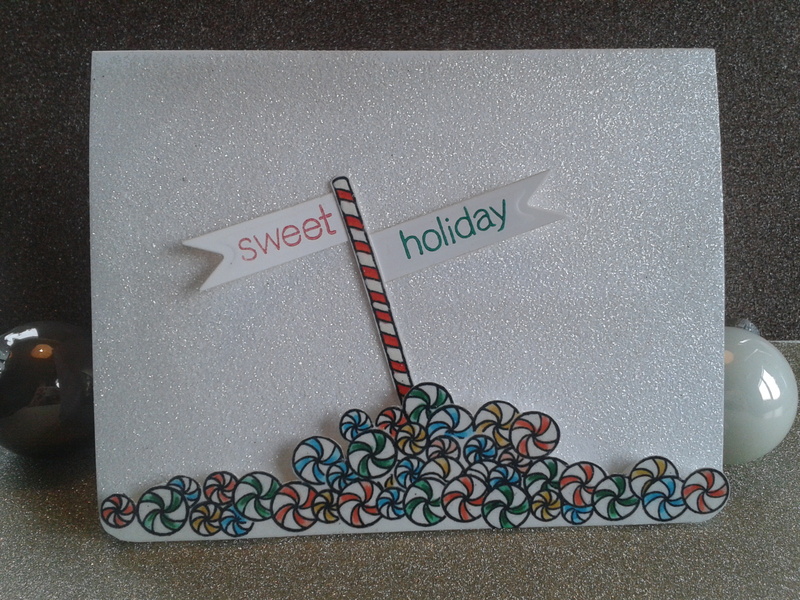 I used the same technique for this card, stamping all the candies from the Sweet Christmas set, masking as I went. Then I colored with Copics, covered with Versamark Dazzle and clear embossing powder to get the nice sheen. For the post, also from Sweet Christmas, I needed something a big longer, so I used stamped it once, then lined up another atop the first. 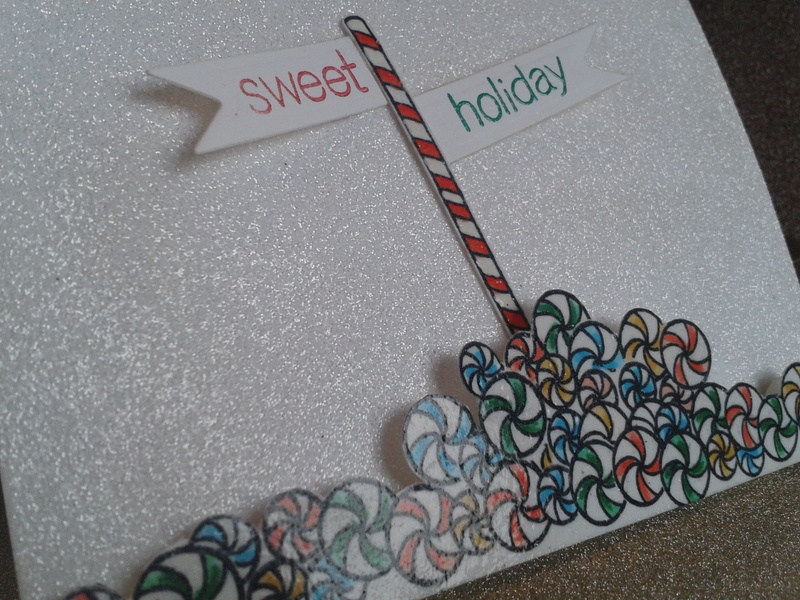 I colored it with Copics and Uniball gel white pen, then used the same technique as with the peppermints. I fussy cut the mountain and the post. 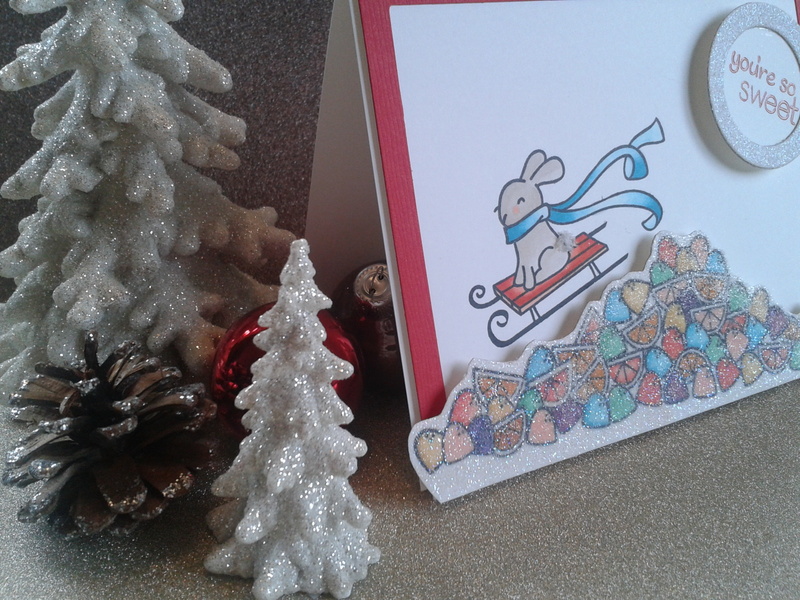 The flags were die cut and stamped with sentiments from Sweet Christmas. 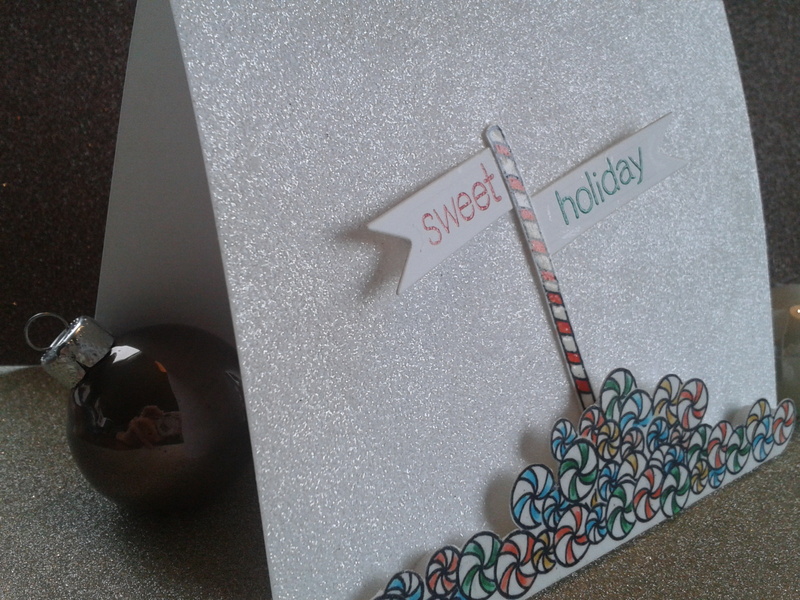 For the background, I covered a whole card with Versamark Dazzle, sticky embossing powder and Stampendous white glitter. Every thing was adhered with foam dots, except the pole. I wanted the flags to pop just a bit at the ends. I just love the effect of the background; it’s like a bed of freshly-fallen sparkling snow, which I used to love crunching through when I lived in New York! 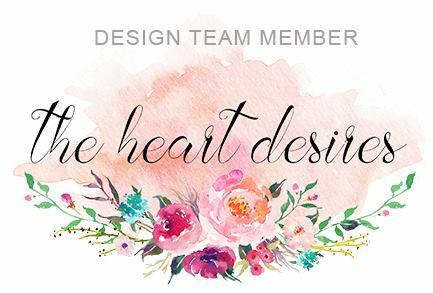 Head over to see the sweet creations from all the Lawn Fawn challenge participants! I hope you are having a dazzling holiday season, with mountains of sweet memories, wherever you may be! Wow, those cards look great. I can’t imagine how long it took. Love how it’s glittery.